Just a handful of ingredients but a symphony of taste – must be Japan. A Japanese housewife named Harumi Kurihara has changed my life a few years ago. I bought her book Everyday Harumi just out of curiosity but it turned into one of my cooking bibles (and I fully agree with this excellent blog entry published by The Huffington Post in 2010 already). The subtitle of Harumi’s book reads: “Simple Japanese Food for Family & Friends” and that is true: it is a simple – yet highly refined – cuisine that makes everybody happy, family and friends alike. 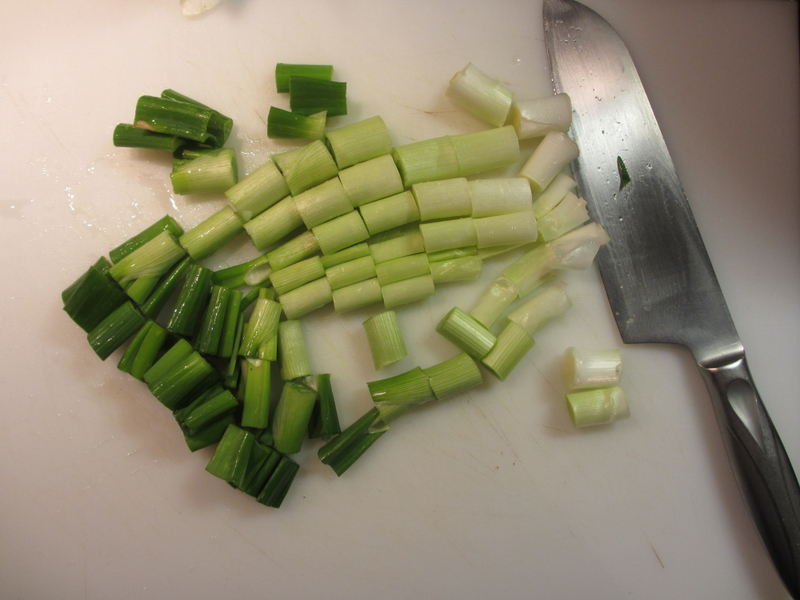 Chop chop: spring onions are key in Harumi’s soup. The Harumi soup I prepared in my Parisian kitchen tonight (you see, France really isn’t that nationalist and old-fashioned anymore!) takes – all in all – just 15 minutes of work. Given the delicious result that seems ridiculous – but this lady chef just knows how to enhance ingredients. Yes, you’ll need some exotic (Japanese) ingredients like Mirin and you should have a home-made dashi stock at hand (don’t use instant dashi, it just isn’t where it’s at). But you’ll see, once you’ve started cooking à la Harumi you’ll buy everything she wants you to have in stock anyway. It’s just too good. 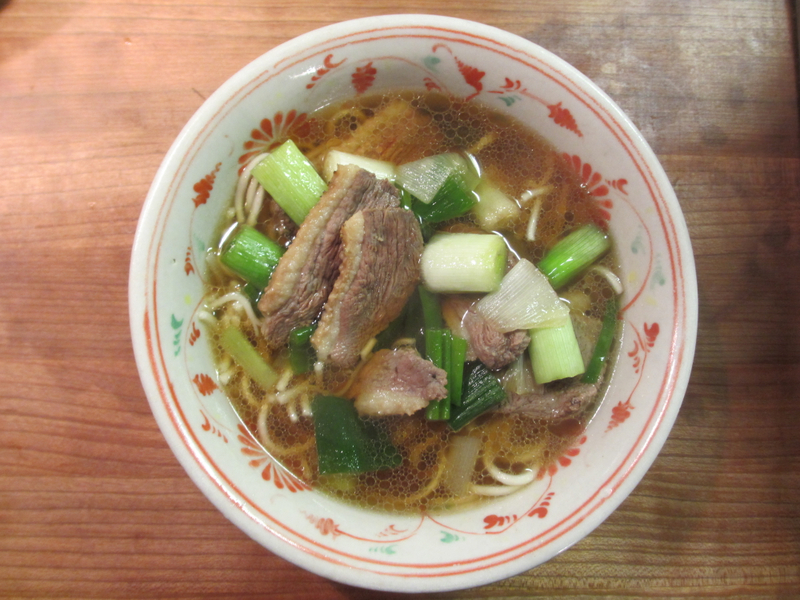 Harumi’s “Hot Noodle Soup with Sliced Duck” which I served my family tonight is a marvel made of just five ingredients: duck breast, spring onions, dashi stock, soy sauce and mirin – and that’s it. And it takes only 10 minutes to cook everything. And it’s great. You add some Asian noodles and you have a beautiful supper. My family ate with delightful devotion. No leftovers whatsoever. Wow! You are so quick this year! I cannot keep up this weekend. I am so pleasantly surprised to see you have this book and that you also like Japanese cuisine. I have another of her books (Harumi’s Home Cooking or something similar) and I have also enjoyed cooking simple Japanese dishes from it. When you want to pass to the “geeky” stage, I strongly advise Japanese Cooking: a Simple Art by Shizuo Tsuji. It’s a piece of art (not much photos though but you will discover it’s like reading fiction and you will want to reread it dozens of times… All the recipes are explained in an impeccable way. The soup looks fantastic (I don’t have it in my book) and I love the new theme of your blog. PS I also agree about dashi. It’s so easy and quick to make it on one’s own… and since it is advised to make a secondary dashi too, it’s very cheap too. With the blog, I’ll go down again sooner or later, Sissi, but right now it’s fun…thanks for your always kind remarks. Glad you like the new theme! Why would you be surprised that I like Japanese? How couldn’t I? I mean, for me, personally, there are only a handful of meaningful cuisines. They are: French, Italian, Chinese, Japanese, Thai, maybe Indonesian. Have I forgotten another one? I actually don’t think so. That doesn’t mean that other countries wouldn’t have great food – they just don’t really represent real “schools”. Anyway: I’m also glad we agree on dashi. And you know what? It is, in fact, the best of all stocks. Far superior to beef stock! I was surprised because of the name of your blog and because I don’t think i have ever read anything about Japanese cuisine here (or maybe I have forgotten). I also like Italian cuisine, but most of what people consider “Italian food” abroad is just bland, low-quality carb-loaded stuff. I totally agree about French, Chinese, Japanese. I also like Indonesian, Thai, Vietnamese, Korean, Indian and try to cook them… Hence the space problem in my kitchen cupboards and fridge. This looks fantastic, I will have to try it soon! How do you make dashi stock? Dashi: 1 piece of kombu (algues, say, 4 by 4 cm), let soak for 30 minutes in 1,2 or 1,4 liters of water. Bring to a boil and remove when the first bubbles show up. Add 30, 50 or even more grams of Katsuobashi, smoked and dried tuna flakes, bring to a boil again and turn off the heat. Let stand and cool until the flakes sink to the bottom of the pot. Use for whatever you want. Best stock in the world. Well, Maria, that’s an interesting problem. I’ve made that soup a couple of times and never had those unpleasant “fat feelings” you’re describing. What could be wrong? The quality of the duck breast? Quite likely. Cooked for too long? Possible. You could try and cut away the fat – but that would harm the overall taste, I’m afraid. So my only advice is: keep trying, experimenting, reduce ingredients, play around. Use more Mirin. And so on. Thanks for commenting anyway! I have Harumi’s book too! You forgot one ingredient: shichimi togarashi! That’s why this soup is called “HOT noodle soup”! 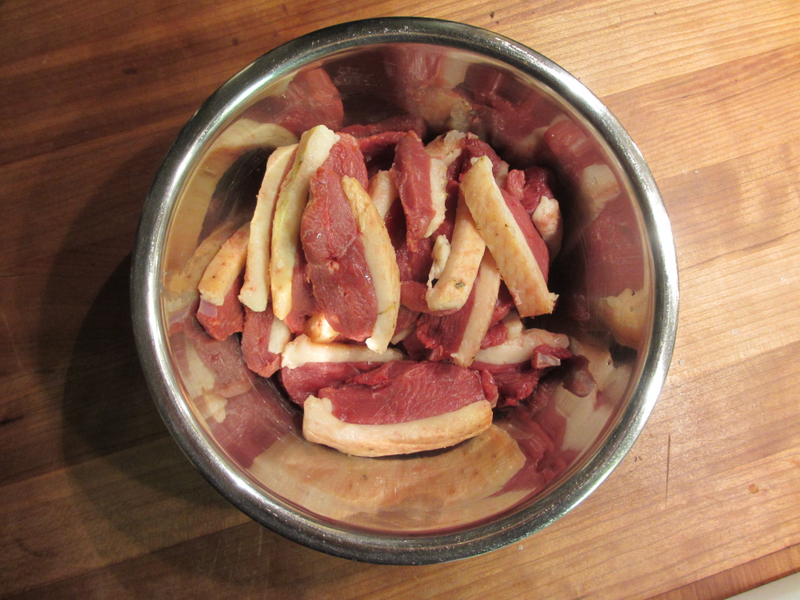 I think this igredient (or another similar igredient) is essential to this soup. I just LOVE a soup with some spicy pepper flavor.